Urban Simplicity: Sometimes two seats are better than one...and they're for sale. Sometimes two seats are better than one...and they're for sale. Yup. It's true. 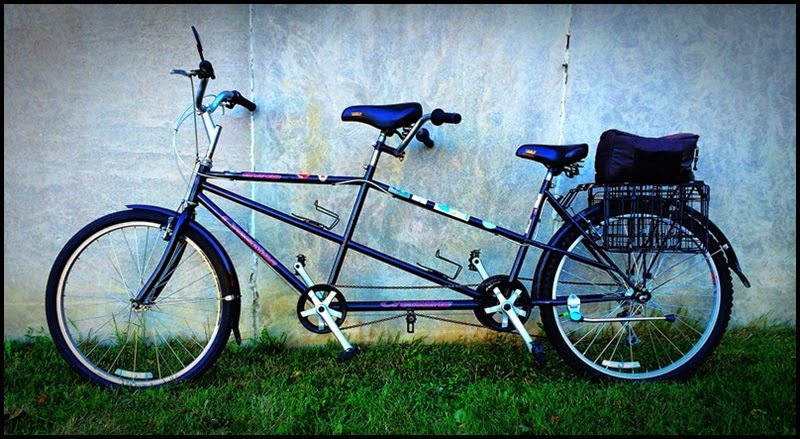 My beloved tandem is for sale. We sort of outgrew it. And by "we" I mean my son and I. This is the bike I used to transport him when he was a kid, now he is a young man. It's a really good and solid bike, it rides great, and is really fun to ride. If you happen to be in the WNY and are interested feel free to contact me. If you want to see some of the specifics of the bike and it's price, click here for its craigslist posting. It is beautiful. Obviously people in the Niagara region of Ontario would be in the market too.